Oh so before I start explaining these let me just start by saying that the first time I had heard about avocados and nut butter together I thought it sounded gross. I had an open mind and ever since that first bite a year or two ago I have been hooked! 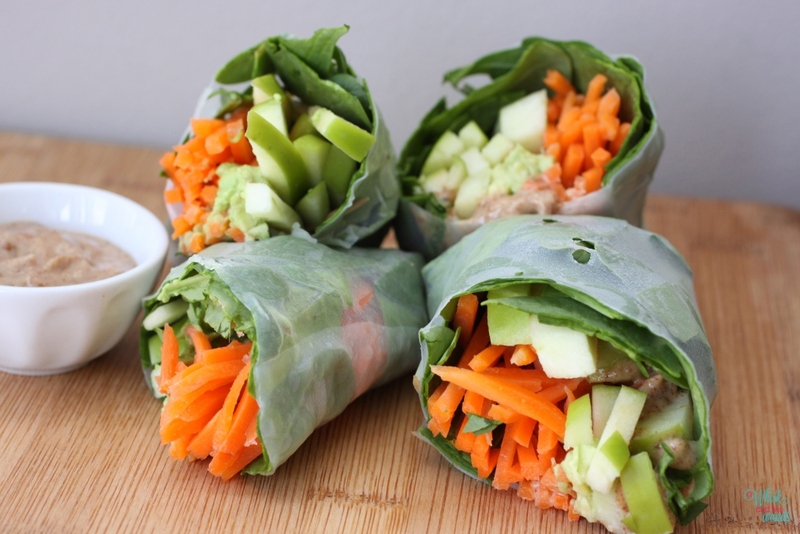 I often make salads with fruits and vegetables and nut butters but today I decided to make spring rolls as we had some left over spring roll wraps to use up. I first made these for lunch but they also make a delicious dinner. I thinned out Kolat Superfood Fushion Blueberry Cinnamon Walnut to use as a sauce, it’s delicious. If you can’t find this where you are you can use any nut butter of choice or add some cinnamon and dried blueberries, or even cranberries. I also think this is great with some other nut butters such as Wild Friends Sesame Cranberry. 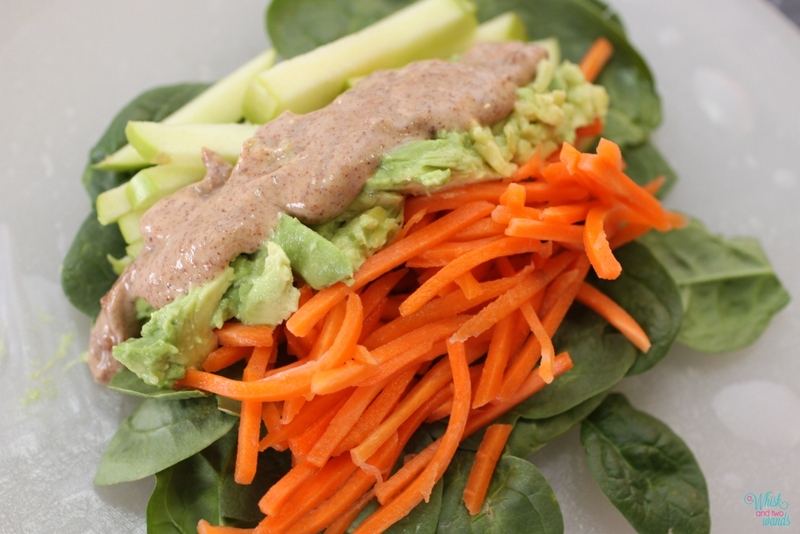 I will put the almond butter “sauce” in the roll if I want something on the go, at home I usually make the dipping sauce. Again I like to think of my recipes more as inspiration, you can make them as I made them, or I also encourage you to customize it to suit your tastes and what you have on hand. Sometimes I add dried cranberries, other nuts or seeds, it all depends on my mood when I make them. 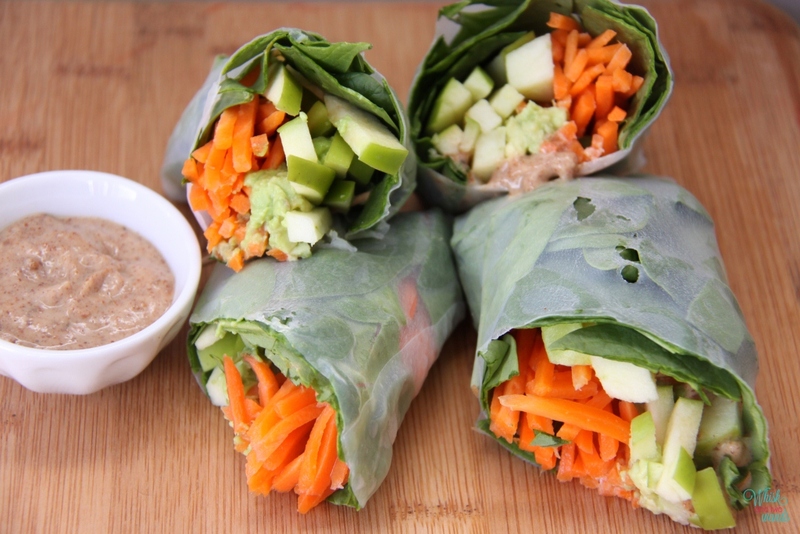 With all of your ingredients ready start by deciding if you want to add the almond butter into the spring rolls or a dipping sauce and if you want it thin down or not. Either way I usually thin mine down a little with almond milk, usually about 50/50 almond butter and almond milk. If thinning down mix almond butter and almond milk to desired consistency. Fill a shallow pan, or I use our dinner plates as they have a rim, with water for soaking your spring roll skins. 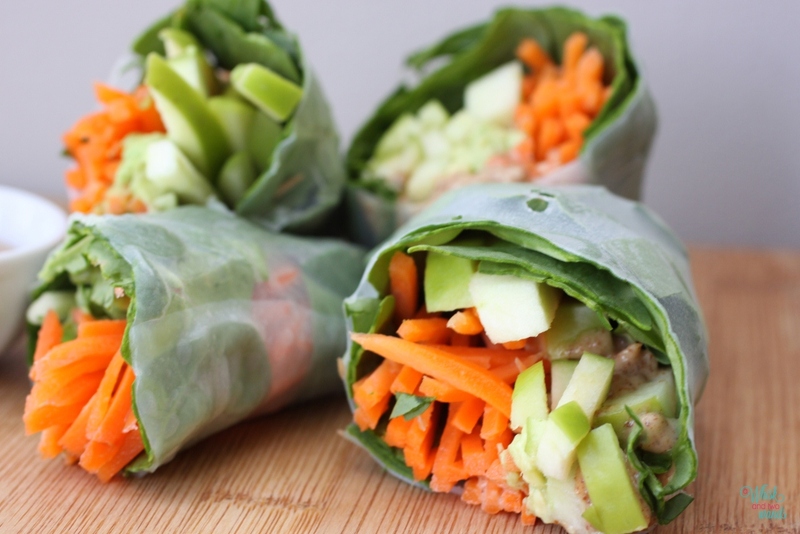 Soak your first spring roll skin until it is soft and stretchy. Lay on a flat cutting board, plate, or damp paper towel. 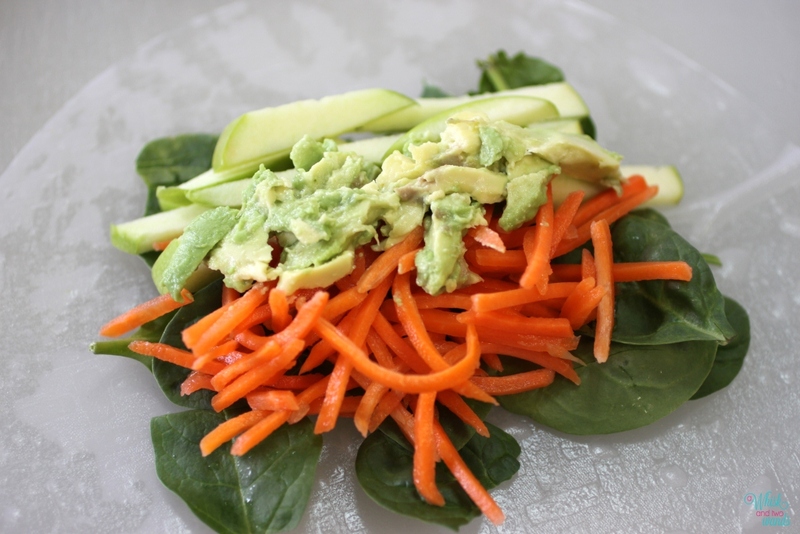 Start layering the fillings, I lay spinach down first, carrots and apples next right next to each other, and top with avocado in the middle and almond butter sauce next to it if I am filling it with the sauce. Add other optional ingredients of choice. With the edge closest to you fold it over the filling and tuck it under the edge of the filling, you want the filling to be snug but not pulling to much you tear the wrapping. I still have good and bad days with this. Fold each end in and roll over to seal. Place on a damp paper towel and I also top with a damp paper towel so they don’t dry out while I make remaining rolls. Mine dried out a little and the halves stuck together as I was trying to arrange them to photograph. I could re wrap them if I wanted to but they held together fine. Repeat making the 2nd roll. Cut in half if desired, or you can eat them whole, serving with almond butter dipping sauce. Enjoy! Oh my, these sound and look incredible! 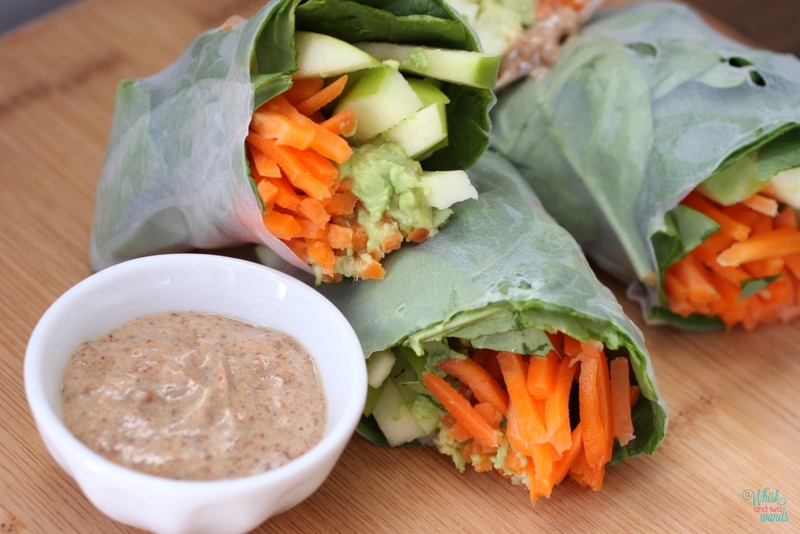 I love Spring rolls and nut butter so they seem like an obvious choice to put together to me. I’ll do the same! Though I think it will be a LONG wait, ha ha ha. Thank you! I couldn’t find the spring roll wraps for awhile when the place I use to get them closed but I finally found them at the grovery store over in the ethnic foods isle! I hope you enjoy them as much as I do! They are perfect for a summer dinner! Yum! These look like they’d make a perfect lunch!